A DELEGATION from the New Communist Party returned to Britain last week after spending two weeks in People’s China. General Secretary Andy Brooks, National Chair Alex Kempshall and National Treasurer Dolly Shaer held talks with the Communist Party of China, Chinese trade union leaders, academics and officials from local and municipal governments during a visit that included Beijing, Nanjing, Guizhou province in western China and the southern city of Shenzhen. During their stay the NCP delegation visited the tomb of Dr Sun Yat-Sen, the father of modern China, in Nanjing. In 1911 Dr Sun led the people in overthrowing the Chinese monarchy and establishing a republic. Forced out of the presidency by warlords Dr Sun continued to fight for a democratic China until he died in 1925. 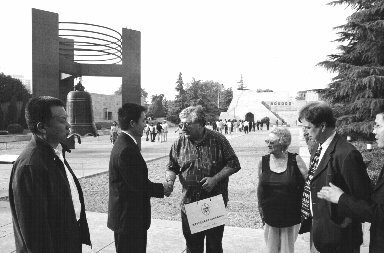 The NCP comrades paid tribute to the hundreds of thousands of victims of Japanese imperialism when they visited the Nanjing Massacre Memorial museum and garden of remembrance. Some 350,000 people were butchered in cold blood by the Japanese invaders in 1937. The NCP delegation had the opportunity to see at first hand how People’s China had resolved the national question during their visit to the Qiandongnan Miao-Dong autonomous prefecture in Guizhou. They took part in a seminar that included local party and people’s government leaders during a tour that included visits to local farming and cultural centres. The population of this mountainous autonomous prefecture stands at 4.27 million and the population of the ethnic minorities is over 80 per cent - mainly from the Miao and Dong people. Central government and the local administrations have taken giant strides in recent years to eradicate poverty and develop the region in what is still one of China’s poorest provinces. New roads and airports have opened up the province for trade and development while great care has been taken to preserve the ancient culture, language and way of life of the farming communities. Modern revolutionary traditions are also remembered in Guizhou, a militant communist stronghold during the struggle against General Chiang Kai Chek’s regime and the Japanese invaders in the 1930s. In Zunyi, some 170 km north of the provincial capital of Guiyang, the delegation saw the site of the Zunyi Meeting during the Long March. Here, in January 1935, an enlarged meeting of the Politburo of the Communist Party of China met to discuss and rectify the errors in military affairs. The “left” adventurism of Wang Ming was defeated and the Comintern commander of the Red Army, Otto Braun, was replaced by Mao Zedong. Under Mao’s leadership the Red Army and the Party was saved from destruction to later advance to final victory in 1949. Immense construction and development has transformed China’s cities in recent years and no more so than in Shenzhen, the sister port to Hong Kong that has been transformed from a village to a booming city of 7.5 million people in just 25 years. Throughout their stay the NCP delegation was overwhelmed by the hospitality and friendship shown to them by the Chinese people wherever they went, strengthening the mutual bonds of friendship and solidarity.